Thanks for this. I'm having a hard time understanding though--are the white concentric circles the -log(p-values)? If so, then what is the Y axis exactly, if anything? And how can you can get -log(p-values) > 0? The y-axis on the left side - if you trace it over horizontally to the right, where it intersects the apex of the circle is what that circle represents. You'll see that most points are on the zero line (or very close to it, in -log space). After that the first line is 1, 2, etc., as you go outward among the concentric circles. As a general question, can we include SNPs from X, Y and mitochondrial chromosomes in the GWAS or multivariate SNP analyses. I am using plink for processing the markers and X,Y and mitochondrial chromosomes markers are disregarded in the QC in plink. 1) is the radial design done purposefully to provide an at-a-glance distinction from gene-based manhattan plots? it is harder to read than the usual linear axis, but perhaps there is a good reason, e.g., above idea or some other reason(s)? 2) i am a stats geek but not a gene/mito guy. is it typical to adjust the p-values for multiple comparisons, i.e., are your example data, for example, raw or adjusted p-values? and how does that affect interpretation of the plot? if raw, do you treat every "outlier" with heavy skepticism? i am assuming that you're working in the classical tradition here. 1. This is really more of an illustration for how to make such a radial plot with ggplot2. 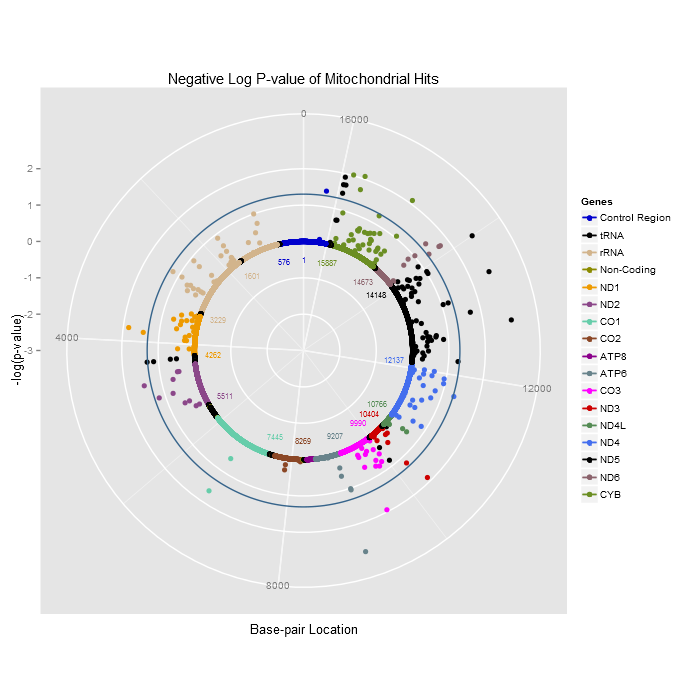 Mitochondrial ideograms with gene annotations are usually displayed in a circular format, so a circular manhattan plot might be more familiar to mitochondria geneticists. Personally, I agree with you - it's difficult to make comparisons of the magnitude of the -logP for different parts of the chromosome, at least more difficult than a linear plot IMHO. 2. Manhattan plots are rarely adjusted for multiple comparisons. But, most folks agree that in GWAS at least, a p-value of 5e-8 is "genome-wide significant" (assuming 1 million independent tests adjusting at p=0.05). I'm not sure what the consensus procedure in mitochondria association testing is for multiple testing correction.